This afternoon, I spent 40 minutes (no, I am not exaggerating--I timed it) on the phone with one of your "customer service" representatives. Initially, I called because one of our "premium" channels had been removed, and I hoped to get it back. Over the course of the conversation, I decided to try to resolve my repeated bill increases. Four months ago, a representative promise me, cross his heart, that my monthly fees would absolutely not, I repeat NOT, go up. That promise lasted for an entire month. Three months ago, it went up $5. I waited to pay until I could call and haggle over the bill, and in the end, my payment was late and $5 more than I wanted to spend. The same thing happened two months ago. As a result of my inability to find the time to call and convince your "customer service" folks to lower my bill, it keeps going up. You're stressing me out, and it needs to stop. The result of today's 40 minutes? Three crying children and a promise that my bill should be lower next time. Actually, the person told me it would stay low for 12 months, but they've told me that before. Incidentally, in order to get the promise of a bill the amount that I was promised four months ago, I had to agree to give up the premium channel I'd called about. In other words, Comcast 1, MOE 0. I know my blog readers are wondering why I still have Comcast given how crappy you are when it comes to billing and customer service. I don't have a good explanation. Some of it has to do with limited options for cable and internet where we live (way to take advantage of your monopoly). Some of it has to do with trying to minimize complications--switching would require me to take multiple steps that I don't have time to take right now. Mostly, I think it's because I am never one to back away from a fight. That, and I might be just a tad insane. Isn't that the definition of insanity--to keep doing something the same way and expecting a different result? Please don't persist in making my life crazier than it already is. You never did reply to my letter and phone calls. I'd almost let it go, figuring that a company run as poorly as yours with such shoddy product would soon exhaust its fifteen minutes of fame. But then I saw it--a TOMS display at Whole Foods, touting the One-for-One program, playing on the heartstrings of the environmentally- and socially-conscious Whole Foods customer. Thing is, Whole Foods is not one of your so-called authorized retailers. I checked. That means all those folks buying TOMS at Whole Foods are not participating in the One for One program. No, they're not giving shoes to less-fortunate kids unless they are handing them the pair they just bought. 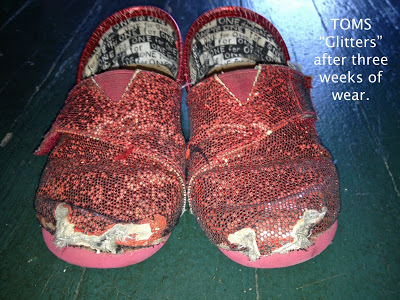 Those unsuspecting well-intentioned folks also don't realize they're out of luck if their TOMS fall apart like ours did. After all, your company won't replace or exchange shoes that aren't purchased at an official retailer. You, know, whatever. If you want to send mixed messages and take advantage of the good will of people, go right ahead. It'd be awesome, though, if you felt just a tad guilty about it. Here's my first post about TOMS (link). And the second one (link). Ewww, absolutely slimey business practices make me want to barf! Have you tried tweeting them? @TOMS has 2.1 million followers that might want to know about this!! Hi there! I work for Comcast. I can reach out to my local colleagues to see if we can offer a better pricing option for you. If you're interested in my help, please contact us at We_can_help@cable.comcast.com. Please include your contact information and a link to this page as a point of reference. Gee, Mark is back. He wasn't helpful the first 2 times, why is he trying again? I know! But now he calls himself ComcastMark. I wonder if we are not supposed to notice he's the same guy?